Our charts capture the sky in transition between the stars of summer, led by the Summer Triangle of Deneb, Vega and Altair in the west, and the sparkling winter groups heralded by Taurus and the Pleiades star cluster climbing in the east. Indeed, if we look out before dawn, as Venus blazes in the east, we see a southern sky centred on Orion that mirrors that of our spectacular February evenings. October also brings our second opportunity this year to spot debris from Comet Halley. As the ashes of the Cassini spacecraft settle into Saturn, the planet reaches a milestone in its 29-years orbit of the Sun when its northern hemisphere and rings are tilted towards us at their maximum angle of 27.0° this month. In practice, our view of the rings’ splendour is compromised at present by its low altitude. Although it shines at magnitude 0.5 and is the brightest object in its part of the sky, Saturn hovers very low in the south-west at nightfall and sets around 80 minutes before our map times. The rings span 36 arcseconds at mid-month while its noticeably rotation-flattened disk measures 16 arcseconds across the equator and 14 arcseconds pole-to-pole. Catch it below and to the right of the young crescent Moon on the 24th. The Sun moves 11° further south of the equator this month as sunrise/sunset times for Edinburgh change from 07:16/18:48 BST (06:16/17:48 GMT) on the 1st to 07:18/16:34 GMT on the 31st, after we set our clocks back on the 29th. Jupiter is now lost in our evening twilight as it nears the Sun’s far side on the 26th. Saturn is not alone as an evening planet, though, for both Neptune and Uranus are well placed. They are plotted on our southern chart in Aquarius and Pisces respectively but we can obtain more detailed and helpful diagrams of their position via a Web search for a Neptune or Uranus “finder chart” – simply asking for a “chart” is more likely to lead you to astrological nonsense. Neptune, dimly visible through binoculars at magnitude 7.8, lies only 0.6° south-east (below-left) of the star Lambda Aquarii at present and tracks slowly westwards to sit a similar distance south of Lambda by the 31st. It lies 4,346 million km away on the 1st and its bluish disk is a mere 2.3 arcseconds wide. Uranus reaches opposition on the 19th when it stands directly opposite the Sun and 2,830 million km from Earth. At magnitude 5.7 it is just visible to the unaided eye in a good dark sky, and easy through binoculars. Currently 1.3° north-west of the star Omicron Piscium and also edging westwards, it shows a bluish-green 3.7 arcseconds disk if viewed telescopically. North of Aquarius and Pisces are Pegasus and Andromeda, the former being famous for its relatively barren Square while the fuzzy smudge of the Andromeda Galaxy, M31, lies 2.5 million light years away and is easy to glimpse through binoculars if not always with the naked eye. Mercury slips through superior conjunction on the Sun’s far side on the 8th and is out of sight. Venus remains resplendent at magnitude -3.9 in the east before dawn though it does rise later and stand lower each morning. On the 1st, it rises for Edinburgh at 04:44 BST (03:44 GMT) and climbs to stand 20° high at sunrise. By the month’s end, it rises at 05:30 GMT and is 13° high at sunrise. Against the background stars, it speeds from Leo to lie 5° above Virgo’s star Spica by the 31st. Mars is another morning object, though almost 200 times dimmer at magnitude 1.8 as it moves from 2.6° below-left of Venus on the 1st to 16° above-right of Venus on the 31st. The pair pass within a Moon’s breadth of each other on the 5th and 6th when Venus appears 11 arcseconds in diameter and 91% sunlit and Mars (like Uranus) is a mere 3.7 arcseconds wide. Comet Halley was last closest to the Sun in 1986 and will not return again until 2061. Twice each year, though, the Earth cuts through Halley’s orbit around the Sun and encounters some of the dusty debris it has released into its path over past millennia. The resulting pair of meteor showers are the Eta Aquarids in early-May and the Orionids later this month. Although the former is a fine shower for watchers in the southern hemisphere, it yields only the occasional meteor in Scotland’s morning twilight. The Orionids are best seen in the morning sky, too, and produce fewer than half the meteors of our main annual displays. This time the very young Moon offers no interference during the shower’s broad peak between the 21st and 23rd. In fact, Orionids appear throughout the latter half of October as they diverge from a radiant point in the region to the north and east of the bright red supergiant star Betelgeuse in Orion’s shoulder and close to the feet of Gemini. Note that they streak in all parts of the sky, not just around the radiant. Orionids begin to appear when the radiant rises in the east-north-east at our map times, building in number until it passes around 50° high in the south before dawn. Under ideal conditions, with the radiant overhead in a black sky, as many as 25 fast meteors might be counted in one hour with many leave glowing trains in their wake. Rates were considerably higher than this between 2006 and 2009, so there is the potential for another pleasant surprise. This is a slightly revised version of Alan’s article published in The Scotsman on September 30th 2017, with thanks to the newspaper for permission to republish here. Our October nights are some of the finest for stargazing in the entire year. The temperatures have yet to plumb the bone-chilling depths of winter, but the constellations visible between dusk and dawn include all the highlights of our summer and winter skies. It is just a shame that most of the bright planets are poorly placed at present. The nights begin with the Summer Triangle high in the south. Formed by the prominent stars Vega in Lyra, Altair in Aquila and Deneb in Cygnus, its stands just to the west of the meridian at nightfall, but tumbles into the west by the star map times. 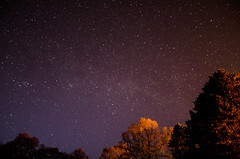 In a dark sky, the diffuse band of the Milky Way flows through it is it arches overhead through Cepheus and Cassiopeia. Look up in the south at our map times for the large, and largely empty, Square of Pegasus, and very low in the south, less than 5° high for Edinburgh, to find Fomalhaut in Pisces Austrinus, the Southern Fish. A young star only 25 light years away, it is surrounded by disks of dust and probably orbited by two or more planets. Only two planets are visible at our map times as they lurk to the south of the Square. 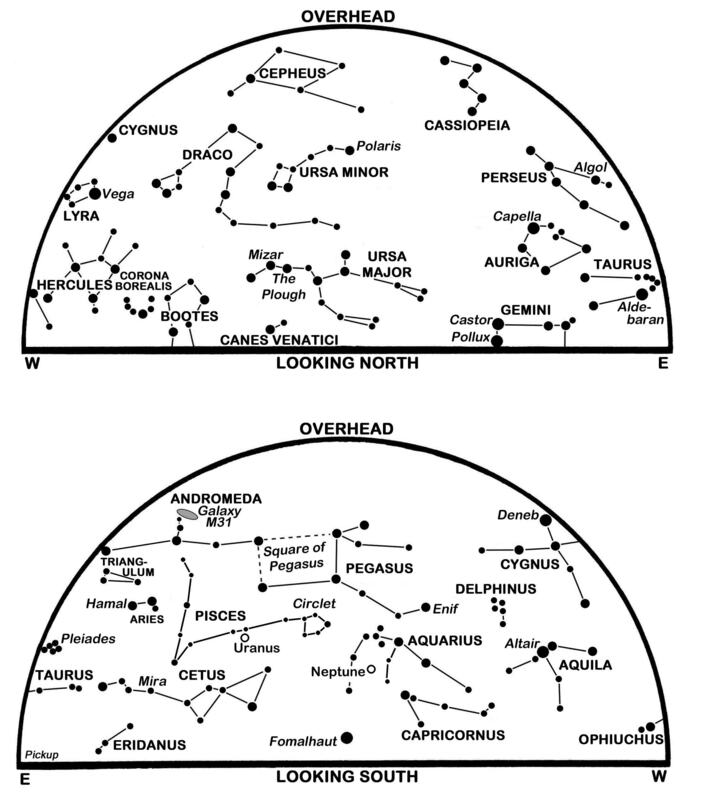 Uranus and Neptune are plotted on our chart in Pisces and Aquarius respectively, but they are binocular-brightness at magnitude 5.7 and 7.8 and demand more detailed charts, perhaps from the Internet, to identify them. They show tiny bluish disks through a telescope, with Uranus only 3.7 arcseconds wide when it comes to opposition at a distance of 2,845 million km on the 7th, while Neptune is currently 2.3 arcseconds and 1,500 million km further away. Both have ring systems, invisible under normal circumstances, and a plethora of moons. For decades, these distant worlds have been classed among the gas giants to distinguish them from the smaller rocky planets closer to the Sun. Both are of similar size, some four times wider than Earth, with Uranus being 51,118 km in equatorial diameter and Neptune only 1,600 km smaller. Unlike Jupiter and Saturn, though, they contain a much smaller proportion of raw hydrogen and helium and instead are predominantly composed of the ices of water, methane and ammonia. Indeed, they are more often now classed as ice giants. 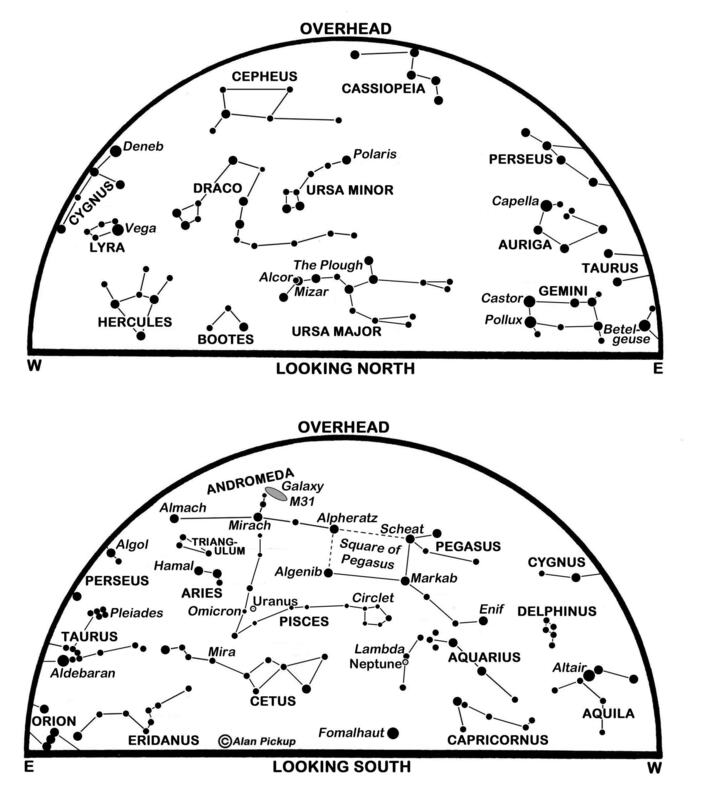 Taurus, climbing in the east, is the forerunner of the spectacular constellations of winter centred around Orion. The latter rises below Taurus over the following two hours and is unmistakable in the south before dawn as Sirius, the brightest star, twinkles furiously in the south-south-east. In northern Orion, 10° to the north-east of Betelgeuse at Orion’s shoulder, lies the radiant point for the Orionids meteor shower which is active in the mornings from the 16th to the 30th. Fast meteors diverge from the point, particularly around the 22nd when numbers may approach 25 per hour under dark moonless skies. The meteoroids were released by Comet Halley. The Sun sinks another 11° southwards during October as sunrise/sunset times for Edinburgh change from 07:15/18:48 BST (06:15/17:48 GMT) on the 1st to 07:17/16:35 GMT on the 31st. British Summer Time ends at 02:00 BST on the 26th when clocks are set back one hour to 01:00 GMT. Nautical twilight at dawn and dusk persists for a little over 80 minutes. The Moon is at first quarter on the 1st and full on the 8th when observers around the Pacific, including N America, see a total lunar eclipse. Last quarter occurs on the 15th with new moon on the 23rd which brings a partial solar eclipse visible over most of N America and the north-eastern Pacific. First quarter comes round again on the 31st. The solitary conspicuous planet is Jupiter but we must wait until the morning hours to see it. The largest of the gas giants shines at magnitude -1.9 as it rises in the east-north-east at about 02:00 BST at present and before 23:30 at the month’s end, climbing high into the south-east and even the south before dawn later in the period. Mid-October sees it slip from Cancer into Leo and by the 31st it has drawn to within 10° of Leo’s main star Regulus. The Moon stands 6° below Jupiter on the 18th when the planet is 35 arcseconds wide and 841 million km away. Venus may be brilliant at magnitude -3.9 but it rises in the east only 40 minutes before sunrise on the 1st and is soon lost from view as it tracks towards superior conjunction on the Sun’s far side on the 25th. Mercury, though, slips through inferior on the Sun’s near side on the 16th and becomes a morning star during the final week of the month. By the 31st, it rises almost two hours before sunrise and shines at magnitude -0.4 low in the east-south-east. Saturn and Mars are challenging evening planets just above the south-west horizon as darkness falls. Saturn, magnitude 0.6 in Libra, is lost from view later in the month as it is swallowed by the twilight, though experienced telescope users may be able to observe it being occulted by the young Moon in the late afternoon of the 25th. 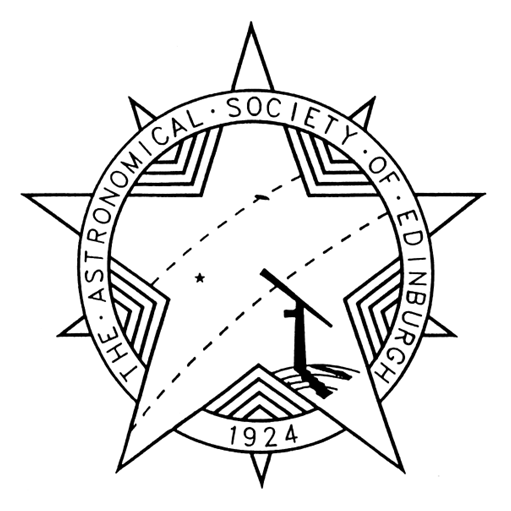 It is 11° high in Edinburgh’s south-west when it disappears behind the Moon’s eastern edge at 16:55 BST, though since they are 21° to the right of the Sun, caution is advised. Mars, now well to the left of Saturn, dims from magnitude 0.8 to 0.9 as it tracks eastwards from 4° above Antares in Scorpius. Catch it 6° below the young Moon on the 28th. This is a slightly-revised version of Alan’s article published in The Scotsman on September 30th 2014, with thanks to the newspaper for permission to republish here.